As your Edmond family dentist, our team at Santa Fe Dental strives to help educate our patients on the many ways that our oral health can impact our overall health. Recent research has shown that the mouth/body connection is very real, and that by suffering from poor oral health we can significantly increase our risk for a variety of health problems. This connection is especially true for seniors who can significantly increase their risk of a conditions such as arthritis, dementia, and even premature death by suffering from poor oral health. Now a new study suggests that food scarcity doesn’t rank as the only cause of malnutrition in older adults – poor oral health also plays a role, according to researchers at the University of North Caroline’s School of Medicine. 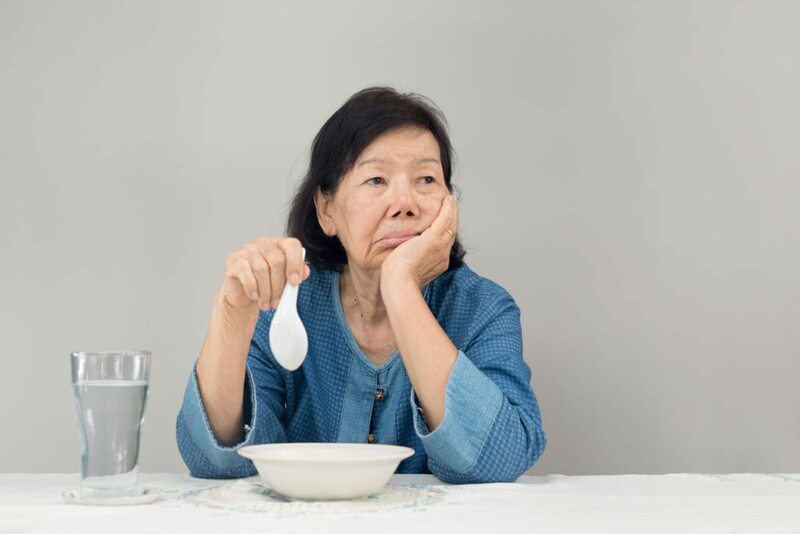 However, while improving access to food offers some challenges, researchers found that for seniors suffering from poor oral health, malnutrition was caused by other issues. As part of the study, researchers examined over 250 patients over the age of 65 that sought care in emergency rooms across three different states. The study participants were screened for malnutrition and then questioned about known risk factors. The overall prevalence of malnutrition in the study group was 12 percent, a number consistent with previous estimates from emergency rooms about twice as high in seniors that don’t require hospitalization or assisted living. Of the three states involved in the study, those visiting North Carolina emergency rooms had the highest rate of malnutrition at 15 percent. Researchers noted that North Carolina also suffers from one of the highest rates of seniors living below the poverty line of any state in the U.S. Of the risk factors catalogued by researchers, poor oral health was found to have the highest impact on malnutrition. Over half of the study participants suffered from some type of dental problem, and those with dental problems were three times as likely to suffer from malnutrition as those without. The researchers defined poor oral health using the Geriatric Oral Health Assessment Index. They did not specify what types of dental problems participants suffered from, just whether the problems they experienced fit within the index. Additionally, about 10 percent of patients dealt with food insecurity, defined as not having enough to eat, eating less meals, or going to bed hungry. Other factors linked to malnutrition such as depression, medical side effects, and social isolation may also contribute in increasing an individual’s risk. “Improving oral health in older adults will be more challenging but also important. Medicare does not cover dental care. Fixing dental problems not only makes it easier for these individuals to eat but also can improve their self-esteem, quality of life, and overall health. We need affordable methods of providing dental care for older adults,” states lead author Collin Burks. For many seniors, the idea that with advanced age naturally comes oral health problems is an issue that your Edmond family dentist and others around the U.S. commonly face. However, the notion that tooth loss and declining oral health is inevitable during our golden years is simply untrue. By practicing quality oral hygiene at home and scheduling regular exams and cleanings we can all enjoy a lifetime of healthy teeth and gums. If you or a loved one suffers from poor oral health, it’s never too late to improve your quality of life by improving the health of your teeth and gums. At Santa Fe Dental, we can help. Schedule an appointment today to start enjoying the oral health and happiness you deserve.